For a dip that makes every party special, try this hummus recipe and then experiment with your own variations. Although hummus may be a new treat for many people, the main ingredient of hummus, the chickpea, has been around for quite a while. These legumes have been cultivated for at least 7,500 years. In fact, Apicius, considered to be the first cookbook author, had quite a few recipes for chickpeas. Today you can find pre-cooked canned chickpeas in any supermarket. I always keep a few cans of chickpeas on hand just in case I want to whip up a hummus recipe or want to toss a few into a salad. But if you find yourself in possession of some dried chickpeas, you can use this recipe to prepare them for your hummus recipe. Place the chickpeas in a bowl and cover with cold water. Drain the chickpeas and place into a pot. Bring to a boil and boil for ten minutes. Reduce the heat and simmer the chickpeas for one hour, replenishing the water if need be. Simmer until soft and then drain and let them cool. 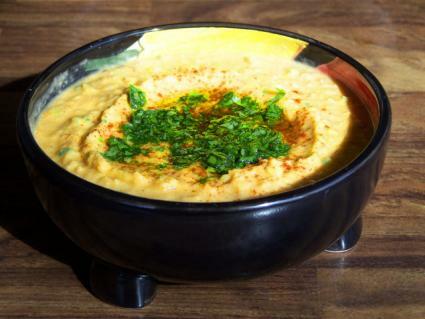 Hummus is a creamy, delicious dip, that can be eaten with pita chips or vegetables. If used as part of a Mediterranean meal, it makes a great appetizer. You could even use it as a spread on a sandwich. Most good hummus recipes will call for tahini paste and garlic. Tahini is a sesame seed paste that adds texture and flavor to your hummus. Tahini can be found at most markets or you can order it online. While you can use fresh garlic in your hummus, I like to use roasted garlic. You can also add roasted red bell peppers, roasted jalapenos, or even black beans. Process the chickpeas in a food processor until smooth. Add lemon juice, garlic, olive oil, cayenne pepper, and tahini. If the hummus is very thick, add a little water while processing until the hummus is silky. Place the hummus in a bowl and drizzle some olive oil over the top. To make your own roasted garlic, use one large head of fresh garlic. Slice the top off the garlic head and place the garlic head on a sheet of foil. Pour olive oil onto the garlic head to cover the cut part of the garlic. Sprinkle with salt and pepper. Roast in a 400-degree oven for 15 minutes or until the garlic cloves are golden brown. Let cool. Use 4 cloves of roasted garlic as a replacement for the two cloves of fresh garlic.